Knowing we had a lion costume already that would fit Mel, age 3 thought maybe it was possible. Cora, age 1, had a pink dress, and viola Glinda the good witch. That makes the tin man and scarecrow left. My husband was willing and so how hard could it be? Tagboard, duct tape, and metallic spray paint were suitable. My costume the scarecrow I attached straw to strings, burlap collar and patches. Claire’s dress was a deal on eBay for $18 with the shoes. With a minimalistic budget we ending up making it work for $35! 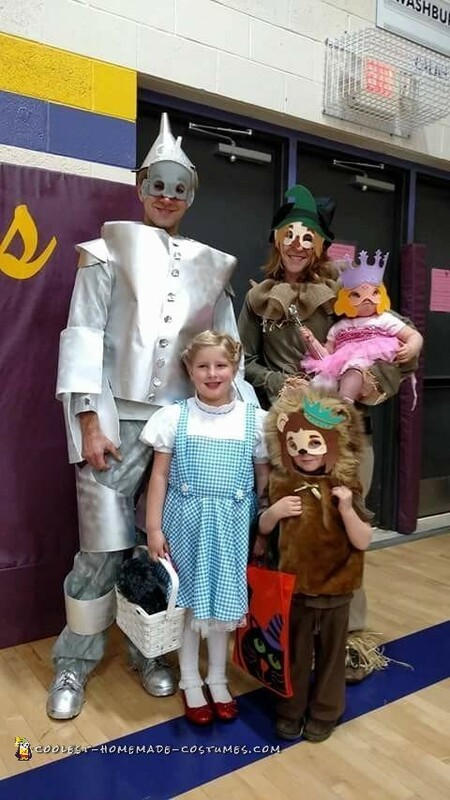 We had fun at our local Lions Club carnival and it we single file walked into the event due to space and it was fun to see peoples faces see Dorothy, then the lion, then the scarecrow and then hey wow there’s the tin man! We had a great time and it was fun to have a costume that was traditional and not trendy.